CEO pay — in Canada, at least — is apparently more closely aligned with corporate performance than most people have suspected. Last week I had the pleasure of hosting Matt Fullbrook, Manager of the Clarkson Centre for Business Ethics and Board Effectiveness, as part of my Business Ethics Speakers Series. Fullbrook’s presentation focused on an interesting study recently completed by the Clarkson Centre. 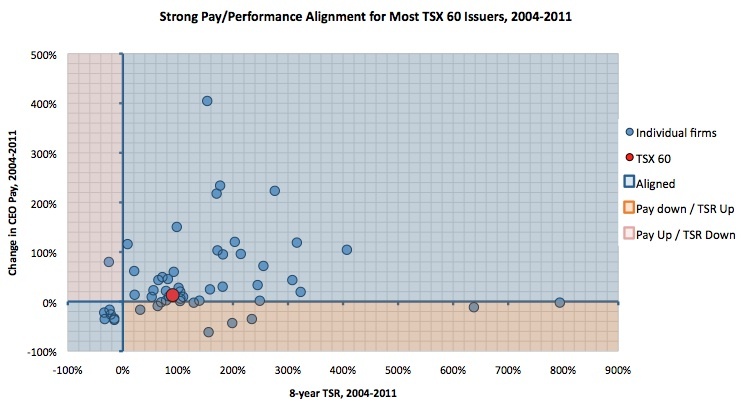 The graph plots change in CEO pay against total shareholder return (TRS). Each dot represents a company listed on the TSX 60. The red dot shows the average for all companies studied. The blue shaded areas indicate companies at which CEO pay and shareholder value have been headed in the same direction (up or down) over the 8 years under study (2004-2011). The other areas show misalignment. The vast majority of companies are in the blue regions. Only at one company did pay rise substantially without a commensurate rise in shareholder value, and several companies showed phenomenal growth in value with no change in CEO compensation. I’ll leave you with just a couple of comments on this. First, it’s worth noting that the x-axis on the graph above shows change in CEO pay, rather than absolute level of CEO pay. So while we can see that not many Canadian companies provided their CEOs with big raises, that doesn’t mean that they weren’t overpaid to start with. They may or may not have been; that’s a different study. But the fact that pay and performance are heading in the same direction is still pretty significant, given that lots of criticism has been rooted in the perception that CEO pay was climbing while investors get shafted. This study shows that, in general, that’s not true in Canada. Second, just what counts as “alignment” is itself a difficult question, and during his presentation Fullbrook was thoughtful in this regard. What we see in the red dot in the graph above is a kind of correlation. It suggests that the pattern in Canada is that a slight upward trend in CEO pay is accompanied by a bigger upward trend in shareholder value. But this leaves open questions such as whether TRS is the right measure of “performance” (even if we focus exclusively on the interests of shareholders). And if we try looking at individual companies, at a particular moment in time, the question of alignment becomes even more difficult. The word “alignment” itself arguably suggests parallel trajectories. But where a CEO is overpaid, it makes sense for pay to go down even while (hopefully) value is going up. The attempt there is to make pay commensurate with value, not to push them in the same direction. Executive compensation continues to be one of the hardest problems faced by corporate boards, as well as an absolutely key ethical obligation. Doing it well is difficult when we’re not even sure what doing it well looks like.